How can this be possible? Seems like just yesterday Ella was celebrating her first birthday with us. I think I say that every birthday. "Weren't you two, like, yesterday?" When Ella was blowing her candles out, she ran out of breath. She looked up, smiled, giggled, and said, "I love cake." Then blew the rest out. Her audience was slightly stunned having never seen someone stop to make such a comment during candle extinguishing. Rara managed to snap a photo just after the cake lover's comment. Smirky face and candles half done. I think you missed your wish coming true this year sweetie, unless, that is, all you wanted was to eat a piece of cake. We were certainly delighted to see that you didn't blow slobber all over the cake as has happened to us in recent times (that kid born in October comes to mind...). Just in case you haven't heard, the organization that handles adoption paperwork in Ethiopia has been slowing down on processing paperwork. They plan to reduce the number of intercountry adoptions by 90% on March 10. I can't begin to guess what may have become of Sally if MOWA processing slowed to a record low, court took several times to pass, and we had to take two trips. She may have been waiting so long that TB would have completely eaten her vertebrae beyond repair. There are people and agencies who have done things that are unethical, but the waiting children are going to be the ones hurt. 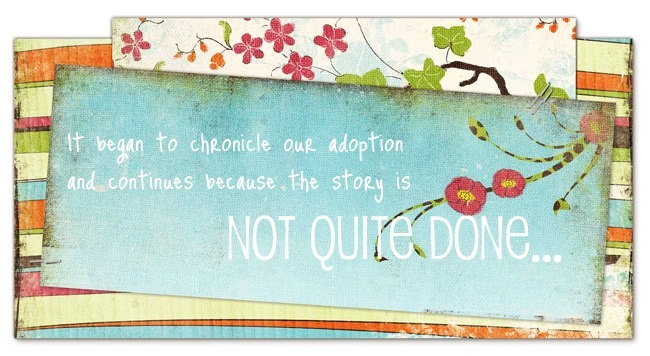 Visit this blog to see if you can help--send them pictures of your adopted children and their stories by March 12 to send along to MOWA as success stories, sign the petition, and make a difference. UPDATE: MOWA is back on track with new staff and prayers have been answered as adoptions are not coming to a halt! If you were sitting across from me when I opened these pictures, you would have seen and heard the excitement. We made that paper airplane! I tested it in my kitchen, trying to make sure it would fit in an envelope and still sail along. I bought special tag board hoping it would last more than a day. Then we printed pictures of our family and pictures from my trip in November of Dirbe and his big sister, Meskerem. I slid a few pieces of gum and stickers in with our letter and wished that we had more space. Dirbe has been wearing the same dress since I met him in November. When I asked Karen about sponsoring him, we both thought he was a little girl. My sister sponsors his big sister, my mom just started sponsoring their big brother, so my family sponsors their family. An incredibly cool thing. But it still doesn't feel like enough. As my sister put it, "It just really is bittersweet because you see how appreciative they are for things that we take for granted. Like dollar store barrettes!" We were all visibly taken with these pictures. We viewed the slideshow quickly the first time then slowly a few more times. Trying to absorb every little detail. You wouldn't have noticed my eyes getting misty or seen the lump in my throat. It's just such a small thing. This business sized envelope stuffed with the thinnest things I could dream up that would entertain a four year old and show him that this family really does care about him. The pictures he's holding? It's a photo of him and his sister and it's hanging on our fridge. 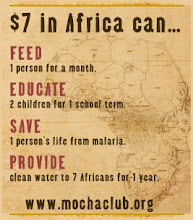 It reminds us that there are children in Ethiopia relying on our prayers. Seeing Simret, Fikre, and Girma has me asking a thousand questions. I hope he really knows that we think about him, talk about him, and pray for him. We haven't dropped off the face of the earth. We were merely swallowed up by winter. We escaped from the ice and snow for a short period of time to visit family, friends, and a place Josiah calls Seaweed. Many meals on the road for seven? sheesh, we ate pb&j with apples as much as we could, but with a long trip like this I kind of lost count of how many drive thrus we visited. Thank you for loving the Military and giving us four free tickets, Seaworld, because we couldn't have done it without you! It wasn't nice of you to throw away our sandwiches at the gate, though. I protested about being a vegetarian (and a cheap one at that) and your kind guard informed me that, "It's a choice, not a medical condition." He may need some sensitivity training. I ate a soft pretzel for lunch, thankyouverymuch. Hardly giving me the stamina to continue for the rest of the day. Good thing we opted for the super gigantic refillable Shamu cup, I think the last few hours were made possible by sugar. Gas for Moby and a few quarts of oil? The skyrocketing gas prices gave us a surprise, I wasn't paying attention as I was gas station potty patrol, but I saw one fill up neared $90. Just go ahead and estimate that we get (on a good day) 15 mpg and we drove 2566 miles round trip. Ouch. So, cheap really isn't cheap and keeping track of the costs really isn't a good idea. But it's certainly nice to try living on the other side of the tracks once in a while, even if only to realize that sitting in the sun in the backyard is just as delightful as the (fancy, heated) pool at the high class resort. When the backyard isn't under a few feet of snow and ice, I mean.